In the Turtles’ lair, Leoardo is sweeping up and pondering where Master Splinter might have gone. Mike decides to take the pet turtles that Master Splinter gave them to Shadow as a present. Raph arrives and explains that Donatello had stepped on one of the pets, which is why it’s missing. The guys then discuss how strange Don has been acting lately. Raph has no sympathy for Don’s plight (especially since he got half his face burned off), but the three decide to check on their brother to see how he’s handling his transformation. They find Don with his robotic arm/gun pointed at his head, as if to commit suicide. Leo pleads with his brother to talk things over, but Don is insistent and pulls the trigger – which emits a “klik” but no projectile is fired – much to Don’s releif. The mechanized turtle then explains to his brothers that he’s merely testing the sytem to make sure it couldn’t harm him. Don seems in good spirits, and when Leo seems surprised, Donatello explains that his current situation, while odd, is better than the alternatives of being paralyzed or dead. The guys then decide to test Don’s abilities and begin to spar. Casey arrives with some groceries and hears the skirmishing, so he excitedly dons his mask and heads into the lair. Jones spies Don and thinks he’s a real enemy, so he attacks. 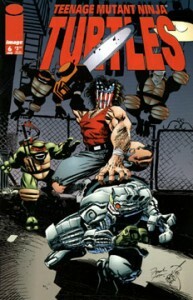 Donatello’s cybernetic computer brain takes contro of the body as it perceives Casey as a real threat. It appears as if the exoskeleton is going to kill everyone’s favorite vigilante, but fortunately Donatello regains control in the nick of time, thanks to some fast talking from Leo and Casey. Casey and Mike head back to the Jones’ apartment where they meet April and Shadow. Casey hits the showers to get ready for a party that he’s attending with April, and April reveals to Mikey that he’s now a professional writer, as Poetry Digest has purchased two of his poems. Mike tells April to keep the check as he wants to help out more than just as a babysitter. Jones congratulates Mikey and leaves with April. Mike spends the evening playing video games with Shadow and then reads her a bedtime story – only instead of Shadow falling asleep, the ninja conks out. Shadow gets up and starts playing games again, when she spots an open door and goes to investigate… and gets kidnapped!